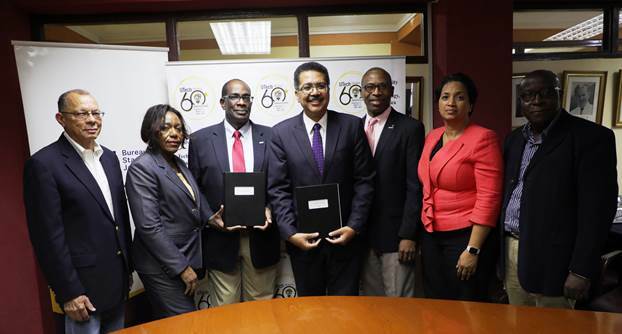 UTech, Jamaica and Bureau of Standards, Jamaica sign Memorandum of Understanding to Expand the teaching of Metrology — UTech, Ja. Mr. Stephen Wedderburn, (3rd left) Executive Director, Bureau of Standards, Jamaica (BSJ) and Professor Stephen Vasciannie (centre), President, UTech, Jamaica display copies of the signed Memorandum of Understanding between the two institutions following the signing ceremony on Thursday, October 4, 2018 at the University’s Papine Campus. Participating in the milestone moment (from left) are Mr. James Rawle, Chairman, Standards Council, BSJ, Mrs. Julia Bonner-Douett, Director, Standards Division, BSJ, Dr. Garfield Young, Dean, Faculty of The Built Environment (FOBE), Professor Nilza Aples, Dean, Faculty of Engineering and Computing and Dr. Amani Ishemo, Associate Professor, Rural Development, FOBE. STEM (Science, Technology, Engineering and Mathematics) education at the University of Technology, Jamaica on October 4 got a boost with the signing of a revised Memorandum of Understanding (MoU) between the University of Technology, Jamaica and the Bureau of Standards, Jamaica for the incorporation of Metrology and the introduction of the rudiments of Standards and Quality into the engineering and science curricula. The revised partnership led by the Faculty of The Built Environment will have immediate harmonization of related Standards and Quality into the curriculum for the Master of Science Degree in Integrated Rural Development offered by the Faculty and scheduled to commence in January 2019.